White or colorless Diamonds are the brightest Diamonds. 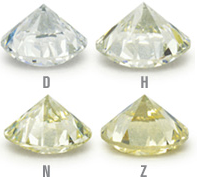 Many Diamonds have a slight yellow tint causing a dimming effect on the brilliance of a diamond. A chemically pure and structurally perfect Diamond has no hue, and consequently, a higher value. The color scale ranges from D, which is colorless, to Z, which is yellow. CARAT WEIGHT Carat is a Diamonds measure of weight, not size. One full carat is equal to 100 points. 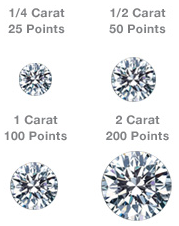 A 3/4 carat Diamnd is the same as 75 points, 1/2 carat is the same as 50 points etc. 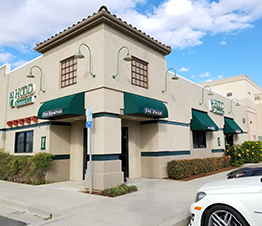 CLARITY Evaluating Diamond clarity involves determining the number, size, relief, nature and position of these characteristics, as well as how these affect the overall appearance of the stone. While no Diamond is perfectly pure, the closer it comes, the higher its value. The Fewer the imperfections a diamond has, the brighter, more valuable and more rare the diamond will be. Diamonds are renowned for their ability to transmit light and sparkle so intensely The quality of cut is crucial to the diamond's final beauty and value. 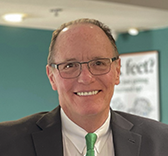 Of all the 4 C's, it is the most complex and technically difficult to assess. 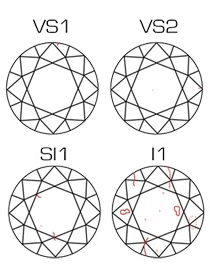 The GIA Cut grading system for the standard round brilliant diamond evaluates three components to consider the diamonds overall face-up appearance. Brightness: Internal and external white light reflected from a diamond Fire: The scattering of white light into all the colors of the rainbow Scintillation: The sparkle a diamond produces, and the pattern of light and dark areas caused by reflections within the diamond. C. B. Hood Diamond Co. Specializes in Excellent cut round brilliant diamonds. Our Endless Fire Collections features Diamonds with not only Excellent Cut, Excellent polish and Excellent symmetry, but also will display the Hearts and Arrows pattern.